Show and Tell Meg: Shop At Home Wild Deal: Divided Wicker Server $9.99! 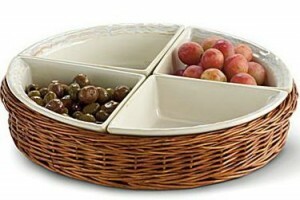 Shop At Home Wild Deal: Divided Wicker Server $9.99! Sign into your Shop at Home account. On the main screen of their website, click on the Wild Deal! Then click on the big, blue Buy Now button. The new window will pop up with the JC Penney website on this item. The price will be $12. Add it to your cart. At checkout, be sure to select to have it shipped to your local JC Penney store so your shipping will be free. Your total will be $12 plus local tax.